The Right of Children to Free and Compulsory Education Act, 2009, followed the 86th amendment to the constitution of India, which made elementary education for children in the age group of 6-14 years a fundamental right. 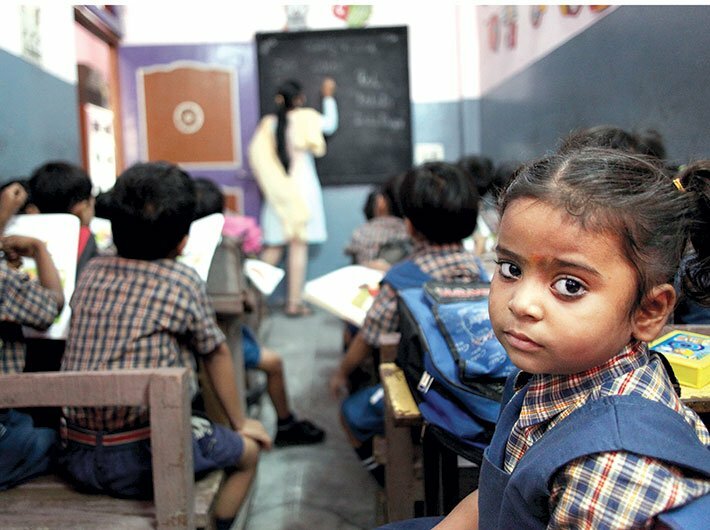 Its passage was greeted by euphoria by many who saw this as a defining moment in education policy – one that would finally enable India to make the transition to universal provision of elementary education. The euphoria was born out of the belief that the legislation – carrying a legal entitlement – would bring about a paradigm shift in implementation of the education programme leading to better enforcement of all its provisions. Five years on, that euphoria has given rise to disappointment, despondency and dismay. Far from improvement, policy priorities reflect abdication, obfuscation and neglect with the situation on the ground showing little change. Going by the official data – DISE – there is no district in the entire country that shows 100 percent compliance of RTE norms. The average score on a scale of 10 is 7.2, with some districts as low as 3.7 (Kurung Kumey in Arunachal Pradesh). If further disaggregation was possible, the figures would be even lower. With the ‘deadline’ (April 2015) for full compliance mandated in the Act upon us, it is necessary to ask, not just what went wrong, but if there is reason to hope for improvement in the near future. Given below are some issues that have contributed to the currently dismal state of the Act and elementary education more generally. They raise critical questions of the possibilities for change in the foreseeable future. In the common understanding of the term it would refer to the bureaucracy that delivers education. For the bureaucracy, therefore, the paradigm shift means that elementary education can no longer be ‘implemented’ simply as a ‘scheme’ but must be ‘enforced as a legal ‘right’. In other words if children do not have access to schools, or are being forced to drop out or are not learning adequately, it is no longer a matter of shortfalls in the implementation of a scheme, but rather of a violation of rights. This has far-reaching implications on the governance or delivery system of education. This fundamental change in understanding of how education must now be treated is singularly missing from the highest to the lowest levels of the bureaucracy, with those in charge of enforcing the rights only partially aware of their responsibilities or the consequences thereof. This is most starkly evident in the fact that despite the legal connotations no accountabilities have been fixed within the education department for violating the provisions in the Act (barring the charging of fees). Thus, if a particular entitlement is not received, it is not known who in the ‘state’ can be held to account. Further, no rules have been framed for grievance redress either to allow people to stake a claim to their rights. As a result, violations go unheeded and children are no better served, by the momentous shift from the Directive Principles to Fundamental Rights. The negligence on the part of the executive is also evident in the fact that critical structural changes mandated by the Act have simply not been initiated. In particular, the provision of ‘local authorities’ (i.e. panchayats and urban local bodies), which have been given the same roles as the state government in implementation and a further role as the first point of call for grievance redress has been completely ignored. In other words, panchayats have received no information of their new roles, or capacity building to perform these roles or resources of any kind to enable them to take on these added responsibilities. Similarly, school management committees (SMC) – mandated to oversee day-to-day functioning of schools and prepare the school development plan, have been treated only cursorily. Formed without elections in most cases, with members not being aware of their roles and meetings rarely held, these statutory bodies are also largely non-functional. With the basic ground level structures of implementation and oversight thus neglected, it is not hard to see why RTE compliance has been so low. The RTE brings with it the force of justiciability. However, the judiciary is not geared to deal with social rights either. First, the lower judiciary does not accept petitions on RTE. They can be admitted only in the high court or the supreme court. It does not take much to realise that these courts are beyond the reach of most ordinary citizens. Second, each violation cannot be taken to the judiciary for redress. But, then what does justiciability really mean? How do citizens approach the judiciary? Third, legal procedures tend to be long drawn, often taking years for a final outcome. That could mean the end of a child’s educational life. How then, does justiciability work? And fourth, the courts are constrained to rely on the executive for answers, which is often not the most reliable source for correct information. This was shockingly revealed in the case of the writ petition [(Civil) No (S) 631] against Delhi administration, which led to 18 state governments informing the supreme court that all infrastructural norms for schools had been met in their states! The court, unable to verify the veracity of this, had to accept the affidavits and close the case, leaving it to public-minded citizens to take the state governments to court on contempt, if they could put together the evidence. It would appear then that the only role the judiciary can play is in interpreting the law or clarifying provisions that have been left for further elaboration. But it is not the obvious recourse for citizens facing daily violations. That must come from the executive. Unfortunately, as we saw above, the executive has no such system in place. Finally, what role has the third arm of the ‘state’ – the legislature (or legislators) played in ensuring RTE? The RTE bill was introduced in the Rajya Sabha in 2008, without a finance note accompanying it. The expenditure finance committee later approved an outlay of '2,31,000 crore, that included the '24,000 crore allocation to states by the 13th finance commission. However, not only was this estimate lower than actual requirement, since it was based on sarva shiksha abhiyan (SSA) estimates only, it did not adequately reflect the needs of all states, especially those that needed much higher allocations to fulfil RTE requirements, even under SSA. Further, the centralised norms of financial allocation fixed in the SSA guidelines were not adjusted to accommodate the varying needs of states, resulting in sharp disparities across states in their ability to meet RTE norms. But the legislators who must ensure the rights they have agreed to provide, and thus that the wherewithal for it is also provided, have yet to make an attempt to intervene in favour of the people they represent. What interest have they taken in the enforcement of RTE, especially as it is amply demonstrated every year, that compliance has been low? Does the obligation of the ‘state’ not extend to them as well? Their lack of commitment has most recently been revealed, in the sharp cut in budgetary allocations to SSA-RTE this year. While the union finance ministry expects to take cover for this gross abdication of statutory responsibility in the 14th finance commission’s recommendation of higher devolution to states, it is not at all clear if the increase in tax devolution can, in fact, make up for the budgetary cuts or what the devolution will mean in terms of inter-state allocations. At any rate, states’ capacity to garner resources, to compensate for shortfalls, is not just variable; it cannot be expected to take place overnight. This implies that many states are likely to see a further deterioration in RTE implementation. It also raises a huge question of statutory obligations of the central and the state governments. But no questions have been raised regarding this serious gap. The history of RTE implementation is a tale of low political priorities. Not only is the state – in all its forms – not committed to ensuring compliance, it has failed to emerge as an important issue for the political class as a whole. Thus budgets get slashed without much ado; violations occur at every level without questions being asked; false affidavits are filed in court without a murmur; and the legislators who passed the law in parliament and are meant to ensure that they protect the rights of citizens are missing in action. What hope is there then for the citizens – children in this case – from the state, which is not even able to guarantee them their fundamental right? Bhatty is senior fellow at the Centre for Policy Research and former coordinator, RTE at NCPCR.